Apple announced a July 12th, 2014 opening date for a new Apple Store in Basel, Switzerland. The country's third most populous city (195,000 people), Basel will be the site of the fourth Swiss Apple Store—and perhaps coincidentally, it's in the heart of the Swiss watchmaking industry. Baselworld is the largest and most important watch (and jewelry) trade show in the world, and as the name suggests, it takes place in Basel. It's where most new high-end timepieces are unveiled, and it's where many distribution and retail agreements either start or get signed. This may be relevant to Apple because the company's unannounced iWatch is the hottest story on the planet. Just in case anyone thinks Apple isn't serious about selling a device for your wrist, the company recently hired Patrick Pruniaux, former vice president for sales at Swiss watchmaker Tag Heur. 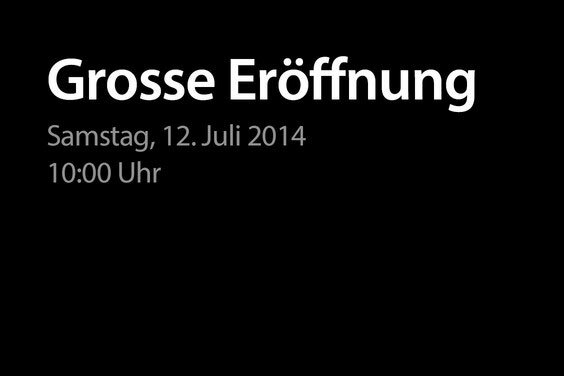 Whether or not it's a coincidence, Apple Store Freie Strasse opens on July 12th, 2014, at 10:00 AM local.